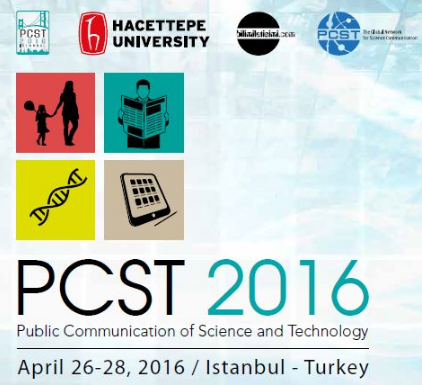 On April 26, 27 and 28, the biannual conference of the Network for the Public Communication of Science and Technology, PCST took place in Istanbul (Turkey). This congress is the meeting point for international scientific communication professionals, from journalists specialized in science and technology, to representatives of science museums, the academic community as well as other professionals of related fields. In this edition, the Studies Centre on Science, Communication and Society (SCS-UPF) has participated in two sessions. In the first of them, Núria Saladié spoke about the European project NERRI (Neuro-enhancement: Responsible Research and Innovation), specifically about the measures developed locally to achieve a greater involvement of stakeholders. The other speakers of the session were Marc-Denis Weitze (Acatech) and Wolfgang Goede (EUSJA), and it was moderated by Brian Trench (PCST). In the second session, along with Padraig Murphy (Dublin City University), Clare Wilkinson (University of the West of England) and Maarten van der Sanden (Delft University of Technology), results from a survey sent to former students of the Master’s programme in Scientific, Medical and Environmental Communication (UPF Barcelona School of Management) were shared. In the discussion following the presentation, the relevance of the results were highlighted and compared to other countries. The current Chair of the PCST is Brian Trench, professor at Dublin City University. Between the years 2004-2006, this position was occupied by Vladimir de Semir, who chairs nowadays the Advisory Board and the Social Board of the Studies Centre on Science, Communication and Society.